The AIM Forward Bin Tippers are capable of effectively handling an extensive range of product through its smooth and controllable hydraulic tipping action. AIM Forward Bin Tippers are renowned through many industries worldwide for having reliably tipped millions of tonnes of product over the years. Our clients choose AIM tippers for the assurance of a reliable, safe and controllable method of tipping their bins. As establishedforward bin tipper manufacturers, we proudly provide Australian-made bin tippers for the agricultural and industrial sectors. 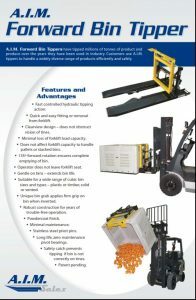 Our own line of forklift bin tippers are designed to meet the unique requirements of the industries we service. With minimal modifications required to fit the AIM Tipper to any forklift, our hydraulic bin tippers are quickly and easily attached and removed. Whilst the tipper is fitted it does not restrict the normal operation of the forklift, including the ability to handle stacked bins and pallets, and the unloading of trucks and production lines. AIM works with clients across many industries to provide safe and efficient machinery that delivers optimum performance and productivity. We give high regard to customer service and fast delivery to your door of our products across Australia and other parts of the world. AIM Tippers can be modified to suit individual requirements if needed. Please contact us to discuss.